All Products > "57879 Tamiya XB Low Ride Pumpkin"
This is a fully factory assembled and ready-to-run R/C model of the Lowride Pumpkin. The painted and finished super detailed ABS molded body is mated to the easy to maintain rear wheel drive M-06 chassis platform. 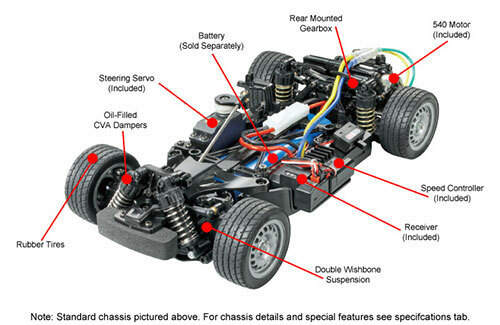 The M06 chassis features a 2WD rear-drive drive-train with fully independent double wishbone suspension. 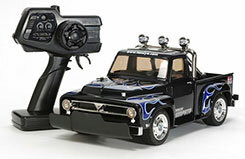 The layout features a longitudinally-mounted battery with the R/C components positioned on either side. The 4-wheel double wishbone suspension is paired with rear 60D Super Grip radial tires for improved rear traction. The pre-installed 2-channel radio gear system operates on 2.4GHz technology which allows you to run your vehicle anywhere without the need to worry about other R/C enthusiasts nearby.